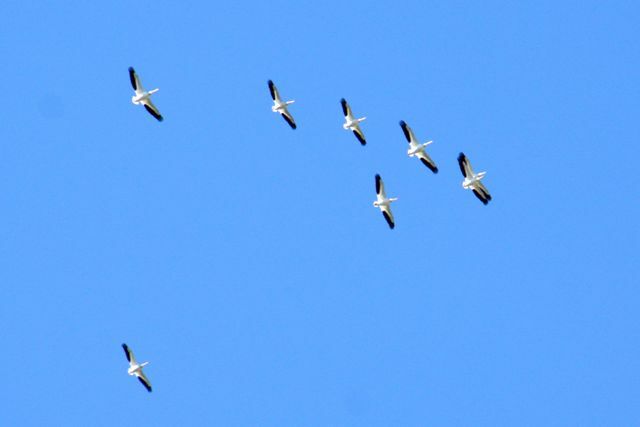 I was walking home from the grocery store one day, about five years ago, when I saw the most unusual birds in the sky. They looked like mystical creatures straight out of Avatar and they were floating in large spirals across the sky. I didn’t realize they were pelicans until weeks later when I saw them again, close enough to identify. I became captivated by pelicans. The more I watched them, the more I realized that they were teaching me something. When I watched them float in their giant spirals, moving slowly from one side of the sky to the other, I realized that their path represents the journey that we are all on – a spiral path instead of a straight line. I used to believe that life was lived on a straight path. We take one step after another, always moving forward, learning, growing, getting married, having children, growing our careers, etc. I hung onto that belief for the first thirty-four years of my life until suddenly I knew it wasn’t true anymore. A medical condition and failed surgery landed me in the hospital in the middle of my third pregnancy. For the next three weeks, in that hospital room, everything I’d ever believed was called into question and the world began to look very different. At the end of those three weeks, I gave birth to my stillborn son. That event was the catalyst that changed me forever. From that point on, I let go of my hope for the straight path and learned to trust the spiral. On the spiral path, sometimes we move in a forward motion, and sometimes we move back. Each time we spiral backward, though, we learn something new and we don’t go quite as far back as we did the last time. The net result is a slow but steady movement in the direction of our purpose. Last year, when I was finally able to dive back into the memoir that had been put on hold when my mom died, I decided to call it The Path of the Pelican: Lessons from a short life. It’s the story of how my stillborn son, Matthew, changed my life. It’s the story of how I learned to lean into the spiral. This week, I’m turning fifty (on Friday, May 20th), and it seemed like the perfect time to launch a crowdfunding campaign to finance the self-publishing of my book. But then some things started shifting for me in recent weeks, and I realized I couldn’t do it. It took me a long time to admit it, but I can’t deny it anymore. I am at the back of the spiral. I am exhausted. I simply do not have the energy to launch a campaign. I have lived the past year pushing into the forward spiral and making significant progress in my path across the sky. It’s been an incredible year of growth for my work, especially after my blog post went viral (and continues to have viral bumps). I’ve had more opportunities for public speaking, teaching, radio interviews, writing, etc., then I did in the first four years of my self-employment combined. I could hardly have dreamed of what this year would bring me. But with all of those opportunities comes a great deal of expectation. On many days, my inbox feels like a tsunami wave of people’s stories, questions, and requests for support or advice. It feels wonderful and I appreciate it, but it also feels overwhelming, and some days, I lie awake at night trembling with the fear that I will let all of these wonderful people down. If all of this came with a financial exchange, I would hire someone to provide administrative support and the workload would be more manageable. But much of it does not come with any money attached, and so I stumble through, trying to hold back the tsunami wave on my own. Please do not read this as a complaint, and please do not feel guilty if you contributed to that wave. I am humbled and deeply grateful for all of it – every story that is shared, every request, and every connection made. But these past few weeks, I’ve hit a wall and I need to be honest. I am making mistakes I don’t normally make. I am letting people down. I am finding myself, some days, standing in front of grocery store shelves in tears, unable to make the simplest decision. And many days, it takes every bit of my strength just to open my inbox. Added to that mix is the stress of the dismantling of my marriage. These past few weeks, my husband and I have been trying to come to an amicable separation agreement, and most days, we’re managing to be kind to each other. But some days, there are old stories that are triggered. And some days, I lie awake at night wondering if I can count on my still fledgling business to pay for the mortgage on the house I’m choosing to stay in with my daughters. And then there have been the other projects I’ve taken on this year that have nothing to do with my business or my family… like co-hosting race relations conversations and sponsoring a Syrian refugee family. I am doing the best I can to juggle all of this, but right now, I need to let go of some of the balls that will bounce and do my best to keep the glass balls in the air. One of those glass balls is my health, and it has begun to suffer. I have had a persistent cough since the beginning of March. A rather scary x-ray result showed a spot on my lungs. That was followed with heavy-duty antibiotics, but the cough has not gone away. My body is sending me a message that I need to listen to. It’s time for radical self-care. It’s time to do what I so often tell my coaching clients to do, and what I wrote about in the follow-up to that viral blog post…hold space for myself first. I simply can’t be of service to anyone if I don’t replenish my own stores first. For at least this week, I’ll be taking time off, canceling coaching sessions, putting an auto-responder on my email, staying off social media, and taking care of myself. I will sleep as much as I need to sleep, go for long walks in the woods, have lunches with supportive friends, and then celebrate my fiftieth birthday with an afternoon at the spa and a quiet meal out with my family instead of the big celebration I’d hoped for. I have been on this spiral path long enough to know that when I trust the wind underneath me and let myself float backwards for awhile, I will eventually gain the strength to once again return to the front of the spiral. Some day soon, I will have what it takes to get my book published. Some day soon, I will finish the Mandala Discovery facilitators’ kit I have been promising people all year. Some day soon, I will launch the new product I had planned to launch in honour of my fiftieth birthday. But for now, I will rest and replenish. And I will pause from holding space for so many people and let some of them hold space for me instead. Thank you for your patience while I hit the pause button. p.s. Because I know people will ask what kind of support I need right now, I will be honest and say that the best kind of support would be some greater financial stability so that I am able to take time off without worry. If you want to invest in my business so that I can return to the front of the spiral and continue to share my work, consider purchasing one of my offerings that takes the least effort for me to support… like Mandala Discovery, The Spiral Path, or Lead with Your Wild Heart. Or… (this takes some humility to include)… make a donation via Paypal. I’m here for you, Heather. Looking forward to rest time with you on Friday. What a wonderful example you are setting for others. Thank you for your honesty. You are human and taking time for you. I highly recommend a book during this time, “Sabbath: Finding Rest, Renewal, and Delight In Our Busy Lives” by Wayne Muller. A delicious read, reminding us that we were meant to work hard and meant to rest well. I just found your blog this morning and this resonates more than you can imagine. I too have been spinning with overwhelm after a year of upheaval. I keep thinking, “just give me a week” and “I’ll be good after I take a day” … but it never seems like enough. I try to jump back into things and I inevitably find myself exhausted again soon after. I hope we can connect more in the future, when we’re both in a better place. I’m subscribing in the hopes that that will be the case. It seems the turmoil of loss, change and new horizons is something we share, as is the case for many of us at “this stage in life”. Happy Birthday, Heather! I’ve been returning to your articles about holding space lately, and then stumbled upon this. Your courage to take the time you need at the backside of the spiral is exactly the sort of thing I need to witness right now. Thank you. I hope your birthday weekend is replenishing, and fun. What a beautiful, open sharing of these deepest truths that many women are now learning….that we must care for ourselves first, despite the fear and the guilt that may surface to tell us otherwise. It’s my mantra, when I’m upset with someone else or when I’m feeling overwhelmed. It’s a mantra I learned after studying and practicing Heartmath. “First thing first” and trusting in that self-renewal and self-care and that the answers we need will come. I’ve had to let go of my need for control and issues of perfectionism, and trust this slow spiral upwards…and it sure seems very slow for me some days. I have a turtle on my altar to remind me that this is my path…slow and steady. I just discovered your work today and signed up for your newsletter…then I wrote you an email! lol. I’m not sure where you are in terms of your self-care etc, but I 100% support you in that. In the meantime I look forward to catching up on your blogs, reading the e-book I received and any future online circles you may have to offer. Blessings Heather!